Physicists have experimentally demonstrated an information engine—a device that converts information into work—with an efficiency that exceeds the conventional second law of thermodynamics. Instead, the engine's efficiency is bounded by a recently proposed generalized second law of thermodynamics, and it is the first information engine to approach this new bound. "Thinking about engines has driven the progress of thermodynamics and statistical mechanics ever since Carnot set a limit on the efficiency of heat engines in 1824," Pak told Phys.org. "Adding information processing in the form of 'demons' set new limitations, and it was essential to verify the new limits in experiment." Traditionally, the maximum efficiency with which an engine can convert energy into work is bounded by the second law of thermodynamics. In the past decade, however, experiments have shown that an engine's efficiency can surpass the second law if the engine can gain information from its surroundings, since it can then convert that information into work. 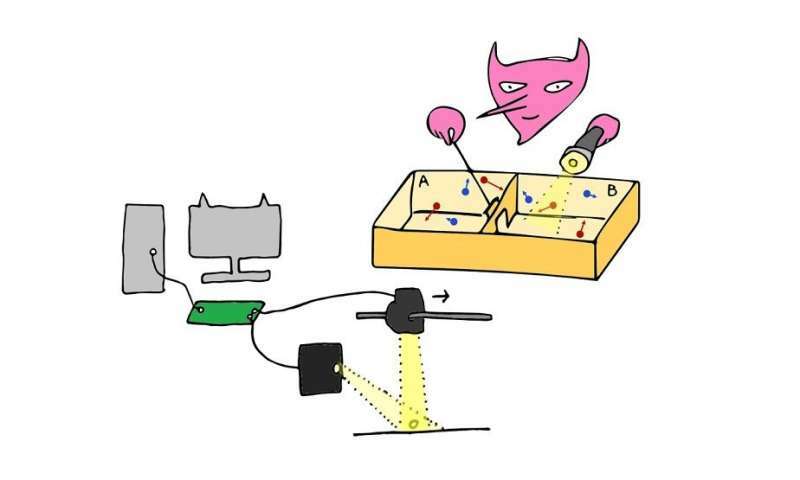 These information engines (or "Maxwell's demons," named after the first conception of such a device) are made possible due to a fundamental connection between information and thermodynamics that scientists are still trying to fully understand. Naturally, the recent experimental demonstrations of information engines have raised the question of whether there is an upper bound on the efficiency with which an information engine can convert information into work. To address this question, researchers have recently derived a generalized second law of thermodynamics, which accounts for both energy and information being converted into work. However, no experimental information engine has approached the predicted bounds, until now. To achieve the maximum efficiency set by the generalized second law, the researchers in the new study designed and implemented an information engine made of a particle trapped by light at room temperature. Random thermal fluctuations cause the tiny particle to move slightly due to Brownian motion, and a photodiode tracks the particle's changing position with a spatial accuracy of 1 nanometer. If the particle moves more than a certain distance away from its starting point in a certain direction, the light trap quickly shifts in the direction of the particle. This process repeats, so that over time the engine transports the particle in a desired direction simply by extracting work from the information it obtains from the system's random thermal fluctuations (the free energy component here is zero, so it does not contribute to the work extracted). Besides their fundamental implications, the results may also lead to practical applications, which the researchers plan to investigate in the future. "Both nanotechnology and living systems operate at scales where the interplay between thermal noise and information processing is significant," Pak said. "One may think about engineered systems where information is used to control molecular processes and drive them in the right direction. One possibility is to create hybrids of biological systems and engineered ones, even in the living cell." How much energy is expended to gather the information (photodiode) compute it (processor of some type) and provide the information (laser etc. for light trap) back into the system? Considering the photodiode, computer, laser etc. as all part of the system, does it still run at 98.5% efficiency? Ha. This type of energy efficiency reminds me of the snow that has been on my neighbors' rooftop solar cells for the past several days... Fallacy of composition obvious to all but the purblind. The second law is truly overcome with the nonlinear advancement in this series of technological advancements: wood burning, coal, oil and natural gas, nuclear fission, nuclear fusion, matter- anti matter reactions... yet to be determined. In other words human creativity breaks the bounds of entropy. But this is not mere passive information. Good heavens, what on earth are you smoking? I don't understand how random fluctuations can be called "information." In information theory, randomness is the opposite of information. What am I missing?